Greetings from The 88 Project! We are bringing you news, analysis, and actions regarding human rights and civil society in Vietnam during the week of November 26-December 2. This week, we highlight the case of blogger and entrepreneur Tran Huynh Duy Thuc on the occasion of his tenth birthday in prison. He also suffered a potential poisoning attack in prison on November 20. 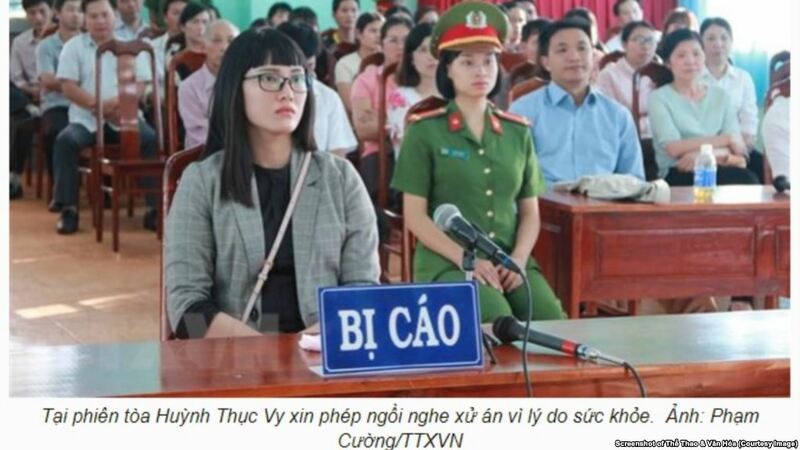 On November 30, the co-founder of Vietnamese Women for Human Rights, Huynh Thuc Vy, was sentenced to two years and nine months in prison for spray-painting a flag in protest. And on November 29, nine more protesters were convicted in connection to the June 2018 national protests; they were sentenced to between three and five years. Freelance journalist Nguyen Van Hoa has written home to update his family on life in prison, and two religious activists, Bui Van Trung and Nguyen Hoang Nam, were transferred to new prisons after protesting forced labor. After completing his three-year prison sentence under Article 88 of the 1999 Criminal Code, Nguyen Huu Quoc Duy was released from prison on November 28. This week, we also remember Nguyen Nam Phong, environmental activist Hoang Duc Binh’s driver, who was arrested a year ago and later sentenced to two years in prison. Several activists are at risk this week, including the Venerable Thich Quang Do, Patriarch of the Unified Buddhist Church of Vietnam, who is back in Ho Chi Minh City after being expelled in September; and Hua Phi, a priest in the Cao Dai church, who has been summoned by police for the twelfth time for providing “untrue” information to outsiders. Also this week, the Ministry of Justice affirmed their decision to disbar lawyer Vo An Don, who was part of Nguyen Ngoc Nhu Quynh’s (Me Nam) defense team. In the news, read about the Communist Party’s reactions to internal dissent following the punishment of well-known publisher Chu Hao, as well as analysis of Asia’s deteriorating civic space as reported in new data from CIVICUS Monitor. Please take action for Tran Huynh Duy Thuc in light of his potential poisoning in prison. And thanks to all those who supported us on Giving Tuesday! November 29 was blogger, entrepreneur, and democracy activist Tran Huynh Duy Thuc’s 10th birthday in prison. Read about his impact on the Vietnamese democratic movement, the current situation for activists, and Thuc’s own fight for freedom using new provisions in the revised Criminal Code. Overall, his situation in prison has greatly worsened. At his most recent family visit, Thuc informed his family that he suffered health issues from a possible poisoning on November 20, and prison authorities are denying him water to boil noodles and the ability to receive letters; they are also considering denying him other items, like a blood pressure monitor, with no legal basis. He asked the international community to intervene on his behalf. Thuc was arrested in 2009 and later sentenced to 16 years in prison for his political, economic, and social commentary. A court in Dak Lak Province sentenced female blogger and activist Huynh Thuc Vy to two years and nine months in prison on November 30. Vy was charged under Article 276 of the 1999 Penal Code for “offending the national flag” for spray-painting a flag in 2017 as a sign of protest. She has a toddler and is currently pregnant with her second child. As such, her sentence will be put on hold until the unborn child turns three, but she will still have to serve it out in its entirety. She believes the Court imposed the sentence as a means to get her to leave the country, which she refuses to do. The daughter of a former political prisoner and co-founder of Vietnamese Women for Human Rights, she says she will continue her work. On November 29, the People’s Court of Bac Binh District, Binh Thuan Province held a trial against nine protesters who had participated in the nationwide demonstrations against bills on Special Economic Zones and Cyber Security in June 2018. They were sentenced to between three and five years, all under the charge of “disturbing public order.” Though there were some claims of violence and property damage in protests, the majority of demonstrations were peaceful, and claims of violence from state media cannot be independently verified. This most recent trial brings the total of protesters known to The 88 Project to be sentenced in connection to the June 2018 demonstrations to over 70. On November 24, political prisoner Nguyen Van Hoa‘s family received a letter written from Hoa at An Diem Detention Center on November 1. In the letter, Hoa said that he would continue to denounce the Deputy Supervisor of the detention center for beating him harshly when Hoa, along with Nguyen Viet Dung, was forced to act as a witness in the trial of Le Dinh Luong on August 16, 2018. At the time of the writing, Hoa did not know that the Deputy Supervisor of the detention center had recently passed away because of an accident. He also encouraged his family to not worry about him because seven years in prison will be nothing to him. He wrote that he can overcome anything because freedom is not free and he is willing to accept sacrifices in exchange for freedom. Hoa is a young freelance journalist who broadcasted footage of the protests in the aftermath of the 2016 Formosa environmental disaster. In October, he sent a letter to his family detailing systemic abuse by multiple parties during his investigation and time sentenced in prison. News this week from a monk on Facebook revealed that political prisoners Bui Van Trung and Nguyen Hoang Nam were transferred away from Phuoc Hoa detention center in Tien Giang Province on November 14 because of their protests against forced labor in prison. Bui Van Trung was transferred to An Phuoc detention center in Binh Duong Province, while Nguyen Hoang Nam was moved to Xuan Loc detention center in Dong Nai Province. The monk also reminded his followers of Nguyen Hoang Nam’s previous incident when he protested against police at Bang Lang detention center, Kien Giang Province, for handcuffing Trung’s hands on the way to Phuoc Ha detention center during a previous transfer. Two officers shot at his eyes with electric rods, causing prolonged pain in his eyes and head that has persisted. Trung and Nam are part of a group of six Hoa Hao Buddhists who were tried and charged under Article 257 (“resisting persons in the performance of their official duties”) and Article 245 (“causing public disorder” — Trung only). They were sentenced to between three and six years in prison, and one member was given a two-year suspended sentence. Many consider this as a case of repression against Hoa Hao Buddhist disciples who had gathered for a religious ceremony and were later provoked into a confrontation with authorities. Nguyen Huu Quoc Duy was released from prison on November 28 after serving a three-year sentence under Article 88 of the 1999 Criminal Code for his Facebook posts critical of the government. He had also called for the release of his cousin, Nguyen Huu Thien An, who was arrested in August 2015 for spray-painting an anti-Communist symbol. November 28 marked one year since Nguyen Nam Phong was arrested in Vietnam. He was the driver for peaceful labor and environmental activist Hoang Duc Binh when Binh was arrested in May 2017. Phong was sentenced to two years in prison and has been badly beaten there and made to perform forced labor. Police of Duc Trong district, Lam Dong Province, accusing Hua Phi of providing “untrue” information to outsiders and offending Vietnam, summoned him on November 29. However, Hua Phi did not go because this was the twelfth time that they sent him a summons order with the same accusation, which he had clarified with them many times. Hua Phi is an activist and a priest in a Cao Dai church. In November,police set fire to farm equipment that belongs to him, possibly in retaliation for attending a meeting with foreign diplomats. On November 24, lawyer Vo An Don, who was part of Nguyen Ngoc Nhu Quynh‘s defense team, received a reply to his complaint from the Ministry of Justice which upheld the decision to “disbar his name from the Bar Association” signed by Deputy Minister Phan Chi Hieu on November 11, 2018. Don was disbarred from the Bar Federation of Phu Yen province in November of 2017, just days before Quynh’s appeal trial. Please take action for Tran Huynh Duy Thuc after he was potentially poisoned in prison on November 20. Please share the news of the poisoning and call on authorities to immediately ensure his safety in prison and improve his prison conditions. A big thanks to everyone who donated on Giving Tuesday, but also to all of our ongoing supporters! Your support makes it possible for us to share information about activists at risk and political prisoners and report on their arrests, trials, health, motivations for activism, and more. You can donate anytime on our website to support projects like our newsletter, Vietnam Political Prisoner Database, and interviews with activists.